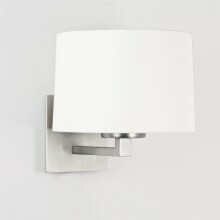 Unique and stylish interior wall light with a distinctive polished nickel finish that will bring a touch of elegance to any room of your choice. The light features a polished nickel bracket that takes both a standard lamp and a flexible LED. The light is switchable, giving you control over which form of lighting to use at any given time. This attractive light includes an integral LED driver and would fit well in a variety of different rooms. It is also suitable for use in bathroom zone 3 and supplied complete with black square fabric shade, which contrasts so strikingly against the polished nickel finish.